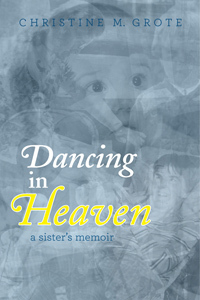 “Dancing in Heaven captures the inescapable pain, unpredictable joy, and resilient decision-making . . . ” Jeffrey Hillard, editor & publisher. *Reviews by Jane: ” RBJ – What inspired you to write a memoir about your sister? CMG – I always knew I would write about my sister Annie. I believed her story had a lot to offer other people in many different ways. . .” Reviews by Jane. *Ink Drop Interviews: “IDI – Christine, I know that ‘Dancing in Heaven’ is about the life and death of your severely disabled sister. Why did you write it? *William Lambers interview: “Christine talks about Dancing in Heaven and also the process of publishing this inspirational memoir.” An interview by William Lambers. Thanks for taking the time to comment, Beth Ann. I’m glad you liked the book and very happy you are passing it on. “I feel as if I know Annie,” was all I was hoping for. I am so glad that you wrote this book! What a great story of love and devotion and her smile will always be with you!!! Loved the pictures. You should be very proud of what you have done! Congratulations on a brave and fine accomplishment. I hope you’ll write more. Thanks, Marion. I have a couple of works in progress, although the progress has been quite slow to date. I am so happy to see your unique story in print! Your very creative narrative ability should be shared with all. I’ve been trying to reach you. I asked Jeff if he could get me your address. I’d like to send you a copy of the book as you were there encouraging me at the very beginning. Your email address attached to the avatar (little blue square) doesn’t work. I hope you check back here. Could you send me your postal address? My email is christine.m.grote@gmail.com. I was looking back through here and saw this comment from you, Jodie, six months later. I want to apologize for not acknowledging it sooner. I don’t know how I missed it. Thanks for the nomination. I would have likely gratefully declined because I’ve already received the Versatile award twice and am running out of people to nominate. 🙂 I will be visiting your blog, though. Please forgive me. I’m following your story now. Thanks for bringing it to my attention. I hope you enjoy Annie’s story. thank you for the possibility of joining forces in the entertainment field. Thanks for sharing your story, David. I am sorry that I am not able to help you with your screenplay. I have not knowledge or experience in this field. You are amazing. I hope you continue to strive forward and reach your goals. Best of wishes. Stop by every now and then and let me know how you’re doing. I’m curious why you only wrote about Carol (besides Annie) and not your other sister or brother, did they not wish to be included? I loved this book! I grew up in a large Catholic family but none of us had any disabilities (that you can see). Your mother is an amazing woman all she did for Annie and now dealing with your father’s Alzheimer’s! Anyway I always thank authors when I enjoy their books and yours was truly wonderful! God Bless! I’m glad you liked Dancing in Heaven. Thanks for reading it and letting me know. All my siblings were in my first manuscript. My oldest sister and brother asked me not to include them, so I revised the book without them in it. I was sad about this, but it was necessary. Apparently not everybody wants to be in a book. Live and learn. Thanks for your interest in Annie’s story. I hope you will come back and let me know what you think after you’ve read Dancing in Heaven. I’m not entirely sure of which video you want. If it is the “Fly” video by Celine Deon, I got it from YouTube and here is the link, http://www.youtube.com/watch?feature=player_embedded&v=U5W4RjTW3zQ . If not, let me know and I will try again. I have a sister who sounds very similiar to your sister. My mother and father were told she would not live past 7 years of age. She will be celebrating her 71st birthday on the 24th of June. We feel that every year past 7 has been a bonus in our lives. She is the oldest of 10 children and has been an inspiration to all of us and the many many nieces, nephews and great nieces and nephews. That’s amazing. You understand how it is. Annie was a gift, as I know you know. I think you will like the story. I happened to come across this book on Amazon and downloaded it to my Kindle and wanted to let you know that you have inspired me as an RN. I know feel like I have more understanding and empathy for patients and their families in similar situations. Sometimes it is difficult to understand what families of disabled people are going through especially during the hospice period. Thank you enlightening me and giving me insight on how I can better myself as a caregiver. Your insight on what your mother has sacrificed really stood out to me. Thank you for writing this book, I know it was difficult for you and your family. I know with all of my heart that you will see Annie dancing in heaven! I’m glad you found my book, Vanessa. It sounds like it may have given you some insights. I am happy about that. I do think it is difficult, as you say, to understand what families of disabled persons are going through. I wrote Annie’s story for that exact reason, to help others understand a little more. Nurses have been my best fans, so I’m not surprised to find you here. Christine – in follow-up to earlier discussions, please contact me regarding use of an excerpt from your book in an upcoming Hospice of Dayton publication. Can you please contact me at 937-256-4490, ext. 4409? Thank you. Thanks. I hope you will let me know what you think, or if you have any questions. Thank you for writing Dancing in Heaven. I too had a sister with cerebral palsy and brain damage from a birth injury. She was not quite as disabled as Annie – her age level was approximately 4 years. Marcia was the oldest of the three of us and our mom and dad took care of her and raised me and my brother as well. Your story so greatly paralleled ours from the doctors telling my parents to put her in a home and forget about her to “she’ll never walk or talk” (both of which she did thanks to the dedication of our mother). I truly believe that having a special family member enriches our lives and is a blessing. Everyone who knew Marcia loved her and learned from her. It is interesting to me how little changed over the years – Marcia was born in 1938 and Annie much later but attitudes and information hadn’t changed much. Thank you for sharing your story – you will educate everyone who reads it about living with such a “special” sister and your family. I feel like I know you and could visit over a cup of coffee and compare lives! Thank you so much for not only reading Annie’s story, but for commenting here. It means a lot to me to know how the book is affecting others. It makes me feel good to know that people are still learning about Annie through the book. It sort of keeps her alive. That’s terrific that Marcia was able to walk and especially talk. I think my parents would have given a lot to hear Annie’s voice and be able to communicate with her. That would be nice to share a warm beverage with you. Sadly, I had to give up coffee many years ago, but am happy to have a cup of tea. What part of the world do you live in Joann? I just felt like I was reading my story of last year. My grandma wasn’t as special as Annie. But she was special in her way. I felt like you wrote the whole entire Hospice experience. I would advise that anyone that has to have or be put in that position use them. They know what to expect and they know how to handle each situation. I believe that they are special souls that know that their patient will never get better and they are the ones to make the way out as easy as they can. My grandmother went home from the hospital like Annie and within a day or two she was no longer really coherent. But they made sure that she was comfortable and had anything she needed. My grandma I believe only lasted five days after she left the hospital; she also had cancer and the doctors wouldn’t treat it. Very similar to Annie. Like I said it was like you wrote my story with different characters. Very, Very, Very well written. Please forgive my delayed response. I’ve been focused on my next book about my father, his life and his journey through Alzheimer’s. I agree full-heartedly with you about Hospice. I’m not sure what we would have done without not only their physical/medical assistance, but also their emotional stability that proved to be a rock for us through such a difficult time. First, I should tell you that I actually have four siblings, including Annie. Two of them asked me not to include them in the book for their own reasons. Privacy, mainly. I did ask my parents a question along the lines of what you ask above. I remember the answer was somewhat vague. I will have to look back at my interview document and get back to you. Thank you for reading Annie’s story. Every reader is important to me. That’s why I wrote the book, to share Annie’s story. I just completed Dancing in Heaven/ I loved it. It reminds me of a friend who has a twin sister much like Annie. Your stories sound like her talking. She always has someone to talk to and tell her deep down secrets. Thank you for reading Annie’s story. It warms my heart to know that people are still being touched by her. She’s been gone nearly six years now. Thank you for replying to my email. I had to have a chuckle because I originally wrote to you regarding my experience with my Grandma and hospice. The reason I chuckled is that you said you were writing about your Dad and Alzheimer’s; my grandpa passed away from that about 10 years now. My grandma did everything she could for him till the day he died in the Illinois Veterans home. Can’t wait to read this book and compare notes. I know each experience is different and hopefully yours didn’t end like mine. Nice to know there are others out there Dealing with the same issues.